Hey guys ! 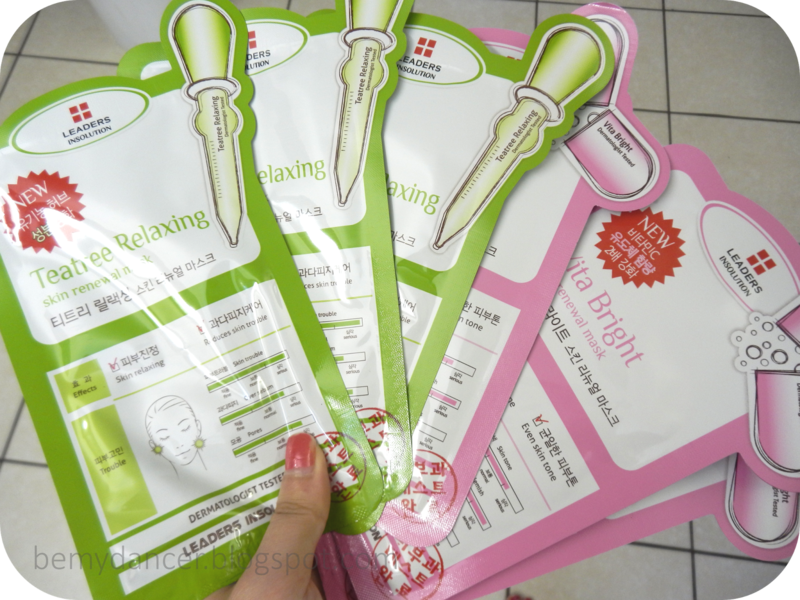 Today I'm going to review the Teatree Relaxing and Vita Bright Sheet masks by LEADERS Insolution ! About 3 months ago I purchased 10 sheet masks from Imomoko.com. Each mask is about $2, so it came to a little over $20 but I also had a coupon code for 20% off so it was even cheaper! Imomoko is actually having a sale of sheet masks for the month of May! 20% off so go off and buy some ! Both of these masks are very similar and I honestly don't know if they really do what each specially claim, but none the less, they are AWESOME !! When I got them they immediately when into the fridge. I like to keep all of my masks in the fridge because I enjoy the cooling sensation when you put it on. I also ALWAYS use my masks after a shower with cleansed skin. This way my pores are ready to absorb all the serum that these masks have to offer! The first mask that I'm going to review is the Vita Bright mask. This one is suppose to be great for brightening and evening out skin tones, so its for those who have some acne scarring, hyper pigmentation, or sun spots. Its suppose to be hydrating also, and this also goes for the tea tree mask that I will also review. As for the smell, I don't really know how to describe it. When I smelled it, I immediately thought of expensive Asian skin care products. In other words, its pleasant. These masks also have a lot of serum inside!! I actually use these masks twice because it has so much product in it! When I take them out of the packaging I pinch the mask and the packaging together which taking the mask out to squeeze out some product. The first time I used this without squeezing out some serum I felt like it was overwhelming. The product also didn't sink in and sat on my face because there was so much ! So I suggest you squeeze some out before using these masks, that way the product will skin in better and you get an additional use out of it! You see how its like soaking! An A+++ to LEADERS Insolution for the generous amount of serum! The second mask I'm going to review is the Teatree Relaxing mask. This one is great for oily and acne prone skin, which is 100% me. I don't really know if this is really effective at treating acne and oily skin but I would like to believe that it helps? This one smells like, guess what, TEATREE !! Haha, its very subtle though. Like the Vita Bright mask, this one is also packed with serum and is very hydrating. After using these masks by skin just feels so great and looks glowing! This is how the mask looks like when its out of the packaging. Like a traditional sheet mask, it has holes for your eyes, mouth, and nose. One downside is that it doesn't really fit my eyes. See those two slits on the sides of the eyeholes? They like fold on top of my inner corner. I always get afraid that some serum will fall into my eyes, but that has yet to happen, so I guess its fine. The sides of the sheet mask doesn't entirely go down to my jaw either. Maybe I just have a large face? lol. Either way, I always spread the serum down my jaw and onto my neck. NEVER FORGET YOUR NECK GUYS ! Did you know that your neck is one of the first areas on your body that show the earliest signs of aging, along with your hands? Hello peeps. This is me right outa the shower with my Vita Bright mask on. The mask is almost transparent which was a surprise to me because most cotton masks are pretty opaque. I usually leave these masks on for about 15-20 minutes and even after that amount of time the mask is still pretty soaking. When times up, I take off the mask and just neatly fold it back up and tuck it into the packaging. I also take a chopstick and swirl it around to make sure the serum that I squeezed out earlier soaks back into every inch of the mask. After that I stick it back into the fridge until the next time I need to use it, which is about once a week unless I feel lazy, haha. Remember to pat the remaining serum into your skin so it absorbs it faster. Even after squeezing out the serum, it still has a hard time soaking into my skin, so I pat it in so it sinks in faster. These masks are definatly part of my skincare routine. I can live without them, but I would rather have them around every week :) I would absolutely purchase more masks from LEADERS Insolution because their masks give so much serum and look at the packaging! ITS SO CUTE! I also have no problems with the product either, no breakouts! Im glad I purchased these masks and its likely that I am going to try a bunch more in the future!